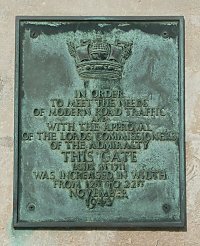 Known as the Victory Gates, they give access to the Dockyard from The Hard. 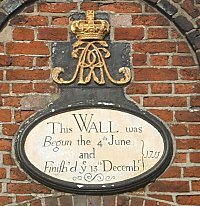 Plaques 1 and 3 are on the gateposts whilst Plaque 2 is on the brick wall to the right of the gates. 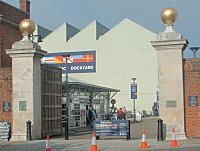 The Victory Gates now provide access to the Historic Dockyard which includes HMS Victory, HMS Warrior and the Mary Rose. The main entrance to the Naval Base is via the Unicorn Gate on Market Way.